I've been making biscuits with Harry since he was about a year old. We've been on a bit of a hiatus lately as my old scales broke, but shiny new ones arrived today so we set to making some, just to test out the scales of course. Stir together the flour and sugar. Add the butter in cubes and rub between the fingers until it resembles breadcrumbs. Squash together until you have a dough, add the milk if it's still a bit dry. Roll out, cut out the biscuits and place on baking tray. Bake at 180 degrees (lower for a fan oven) for about 14 minutes. Mix it all up together, adding water and icing sugar alternately until you reach the desired consistency. Quite runny is best as it is easier to spoon over the biscuits. 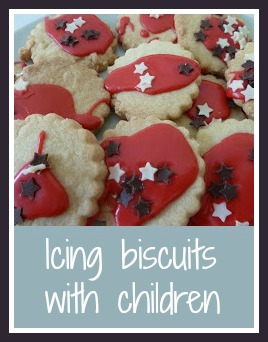 Place the biscuits on a tray, hand the toddler the bowl of icing and a spoon, a plate of decorations, and let them at it. Try and persuade them to put some of the decorations onto the biscuits rather than into their mouth.